2012 Political TV: Ads, Lies And Videotape Newt Gingrich says a pro-Mitt Romney superPAC should stop running a political ad that he claims tells lies about him. That raises the question of whether TV stations have any obligation — legal or ethical — to screen political ads for truthfulness. 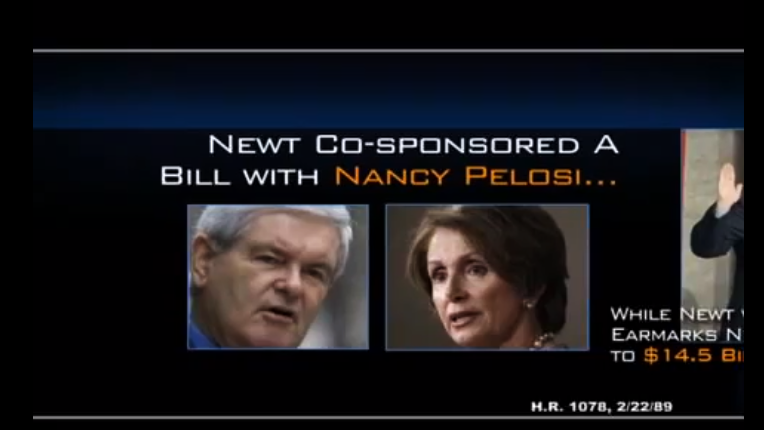 An image from a superPAC ad attacking Newt Gingrich, whose campaign called on TV stations to pull the ad off the air. It's no secret that the airwaves in the GOP primary states have been full of negative ads, charges and counter charges. Earlier this month, the campaign of former House Speaker Newt Gingrich asked TV stations to pull off the air an attack ad sponsored by Restore Our Future, the superPAC backing Mitt Romney. The ad was "patently false, misleading, and defamatory," Gingrich's lawyer said in a letter to Georgia TV stations. The letter asked the stations to refrain from airing the ad at the risk of "potential civil liability." The scene Gingrich's campaign found objectionable comes about 15 seconds into the ad, when photos of the former Georgia congressman and Democratic congresswoman Nancy Pelosi appear on screen with the caption: "Newt co-sponsored a bill with Nancy Pelosi ... $60 million a year for U.N. program supporting China's brutal one-child policy." PolitiFact.com, the political fact-checking site that partners with NPR to assess the candidates' messages for veracity, rated the charge as "pants on fire" false. PolitiFact noted that while the 1989 bill proposed funding for the United Nation's population fund, it also included a clause that prohibited the funding of "involuntary sterilization or abortion." The full Restore Our Future ad that Newt Gingrich's campaign requested removed. It's unclear whether the letter to Georgia TV stations was effective. The general manager of one Atlanta station said he never received it and that Restore Our Future was now running a different ad on his station ahead of the state's March 6 primary. Scott McBride, president and general manager of WJCL and WTGS in Savannah, Ga., said he did receive the letter, noting, "these come down pretty much on a regular basis during the political season." Of the Gingrich letter, McBride said: "I sent it to my lawyers, they look it over, make sure that the stuff in here is pretty much truthful in content, and then we just go ahead and air it, as everybody does." There are different laws regarding different political ads, according to Trevor Potter, who served as Sen. John McCain's campaign lawyer in 2008. Potter said an ad directly from a candidate must be accepted and aired by broadcast stations without editing. "That is not true for these outside groups, superPACs or other organizations. There is no obligation for the stations to take that advertising," said Potter. "It is completely up to the stations whether they take it, how much they take." It's fairly common for candidates to complain about ads and seek to have them pulled by threatening legal action, but it's pretty much an empty threat: The campaign ends, the candidate loses or moves on, with little appetite for an extended and expensive legal battle. Nevertheless, Potter said to expect more challenges in the coming months. "I think you're going to see more of these disputes because you've got more negative advertising," Potter said. "You have, thus, more for candidates to complain about and these negative ads are very effective. So a smart candidate, when they see one of these from an outside group, the first thing they think of is, 'How can I get that off the air?'" These disputes also put TV stations in an awkward spot. "It is a very uncomfortable position that they put us in because, you know, what you do for one you do for all and you want to make sure that everybody is heard in these things," McBride said. "So it is a very uncomfortable position and it's very time consuming, and it costs us money to run these things by our lawyers, obviously. So it's not something that we take lightly." Things could get more complicated for broadcasters under an effort by the University of Pennsylvania's Annenberg Public Policy Center. It's FlackCheck.org site urges viewers to contact stations when they see an inaccurate ad. Kathleen Hall Jamieson, the center's director, said those ads take a toll on how we view candidates. "If you have a series of candidates in front of you and you decide not to vote for one of them whom otherwise you would support — because you've been misled by third-party advertising — and you believe that something is true about that candidate that is in fact false," Jamieson said, "you may cast a vote that you wouldn't have cast otherwise." She said that unchecked, the ads lead to cynicism about politics and discourage voting. But absent a change in the law, getting the superPACs to change their ways is going to be an uphill climb.